only in the 90's . . . still the best decade ever! For the Saturday PWS show, Mascarita Dorada vs. DEMUS 316. Still looking forward to seeing what match they have for Dorada in PWG. Also, looking at the names still not announced in matches yet, there could be a chance the PWS show could have Davey Richards vs. Harry Smith. Tommy Dreamer has a message for Kevin Steen ahead of their LA Street Fight. I cannot wait for next weekend... its going to be so huge. So much going on, it is literally overwhelming. All the wrestlers showing up, deluxe photo ops, video ops, bikini ops and ofcourse 3 amazing wrestling shows. The Franchise13 wrote: I cannot wait for next weekend... its going to be so huge. So much going on, it is literally overwhelming. All the wrestlers showing up, deluxe photo ops, video ops, bikini ops and ofcourse 3 amazing wrestling shows. Whats the top match you're looking foward to and who are you most looking foward to meeting? Bikini ops? Bikini ops??? How do you know this and who is going to be in a bikini? Nitro Girl Spice, Shelly Martinez, Fifi The Maid, and Miss Tessmacher. Shelly and Fifi on Friday night (6pm), Tessmacher and Spice on Saturday morning (10:30am). Last year with Traci Brooks, SoCal Val, Alicia Webb, and Stacy Carter was a success that of course they're doing it again this year. No mention of whether it'll be poolside like last time. 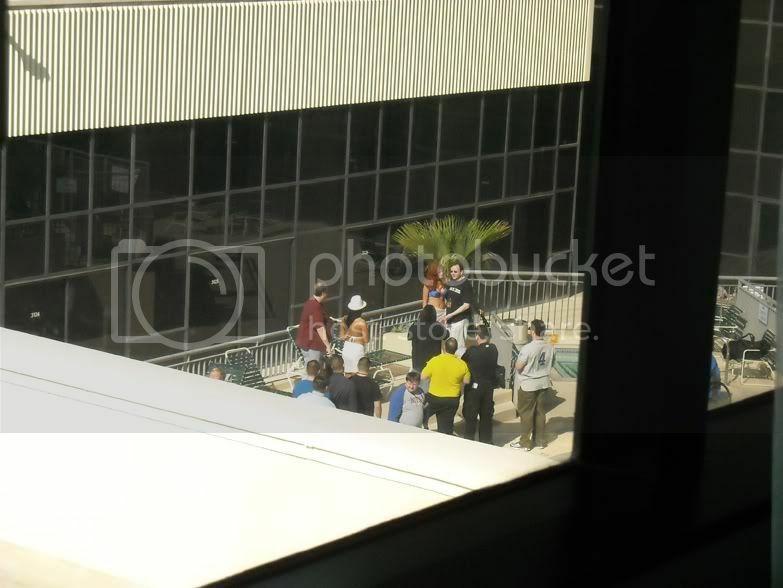 Hell, my hotel room last year had a pretty good view of the photo op taking place. Gabe Sapolsky just announced through Twitter and Facebook that Johnny Gargano will be off the DGUSA Open The Golden Gate show on Friday as part of WrestleReunion. Gargano's back injury was still lingering and all sides decided that it was better not to take a chance with damaging it any further. "I'm REALLY sorry about LA guys," Gargano said on Twitter in response. "You guys deserve the best. That's not me right now. The show will still rule!" Sapolsky quickly added to his announcement that Low Ki will be making his DGUSA debut on the show and that a revised card for the show would be posted soon. Plus when you have the freestyle that they added on there, it should be a very fun show. I feel like considering the circumstances, those would probably be the best options though. since gargano can't make it, i think he should be booked for at least one PWG show when he gets better. So Cal Punk wrote: since gargano can't make it, i think he should be booked for at least one PWG show when he gets better. What a great idea. He wasn't that stand-out to begin with; let's book him now that he's bound to end up a worse wrestler! Shane Douglas is coming back via Totally Real Underground Entertainment. If you missed him last year, here's another chance as he's charging a mere ten bucks for a pic or sig (fifteen for both). There's too many to choose... Again, it's overwhelming. I'm curious about all the DGUSA matches. The Saturday PWS show has some fun matches. I can't wait to see the Legends Royal, New Age Outlaws, Great Sasuke teaming with El Generico to face The Bucks, Steen vs Dreamer, and Davey vs Hart Smith. And then the PWG Show... The six man tag, seeing Tozawa back and more. Pretty pumped for the card though. The only match that I am sort of unsure on is Low Ki/BxB. It was definitely the best to do of the options available (the other real two being Ki/Sami or Ki/AR Fox, which would be better suited for EVOLVE iPPVs), but at least out of all of the Japanese talents, Low Ki/BxB would probably have been on the bottom tier as far as DG guys vs. Low Ki. I just am not entirely sure if BxB will make a very good base for Ki, but I am very interested in seeing how it turns out. PAC/Tozawa I am particularly excited for. I really liked their match in Atlanta last year a lot, but I felt that they could have done a bit more if they wanted to, which I am hoping they are able to do here. On note of that, I actually made a video for the DGUSA video competition to promote this show, although it is promoting the card that was previously set. Figured this would be an alright place to post it at least.
. I made one for EVOLVE 10 as well which should be in the related vids. You just brightened an otherwise awful day.